LAHORE: Media is the fourth pillar of the state and the Pakistan Tehreek-e-Insaf (PTI) government is will soon clear outstanding dues of the news organisations, Prime Minister Imran Khan announced on Thursday. 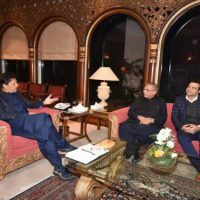 “Our government is committed to the freedom of expression and has full support to the media industry,” the premier said in a meeting with DailyPakistan’s Chief Editor Mujeeb-ur-Rehman Shami and TV anchor Kamran Shahid at PM House in Islamabad. Special Assistant to the Prime Minister on Media Affairs Yousaf Baig Mirza and PM’s spokesperson Iftikhar Durrani were also present on the occasion. Khan assured the journalists that any proposal to help the media industry in their ease of doing business would be given serious consideration by the government. He also directed the Punjab government to allocate funds for the renovation of historical Badshahi Mosque, which is situated in the heart of Lahore. The Mughal era building is said to be constructed between 1671 and 1673 under the supervision of Fida’i Khan Koka, who was Mughal Emperor Aurangzeb’s brother-in-law and the governor of Lahore. After only two years of construction, the mosque was opened in 1673. Badshahi Mosque’s splendor is influenced by the Jamia Mosque of Delhi which was built by Mughal Emperor Shah Jahan.